When Dr. Allen Ditto retires on Jan. 31, he has plans for the fine motor and problem-solving skills he honed during his almost 40-year medical career. HAGERSTOWN, Md. (AP) — When Dr. Allen Ditto retires on Jan. 31, he has plans for the fine motor and problem-solving skills he honed during his almost 40-year medical career. 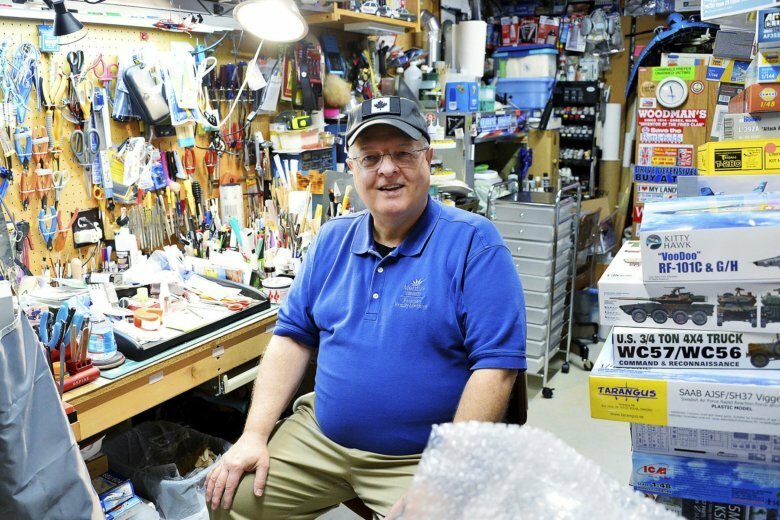 He will tackle the collection of 4,000 models — mostly airplanes — he’s stockpiled in the basement of his Fountain Head home in Hagerstown. Since becoming a doctor, he said, he had time to purchase models, decals and supplies over the years, which he referred to as “shopping therapy,” but no time to put them together. During his career, Allen’s put together four models, estimating they take an average of 100 hours each. When Ditto visited his patients in the hospital, he generally worked 110 hours a week. Around 2005, his average work week dropped to about 85 hours. She is not retiring from her job as accounting manager of the Maryland Symphony Orchestra, for which she has worked since May 2012. Judy looks forward to coming home to meals cooked by her husband, who has been learning to cook through Blue Apron meal kits and is interested in taking cooking classes in Frederick. “I bought myself an Instant Pot and sous vide,” Allen said, referring to a process of cooking by vacuum sealing. He also is taking over the house cleaning, a task he has discovered he likes. It will be the end of an era when Ditto retires on Jan. 31. The third generation of family-practice doctors in Hagerstown, Ditto’s retirement brings to an end 97 years of local medical care by Dr. Dittos. “Ditto-Ditto-Ditto” was the headline that ran with a brief AP piece, prompted by a local newspaper story after Allen Ditto returned to Hagerstown to start his medical career. He set up his solo practice on Aug. 2, 1982. There currently are four generations of Ditto doctors, though. Allen and Judy Ditto’s son Andrew Ditto is a family practice doctor in Navajo Nation in Winslow, Ariz., after graduating from the University of Maryland School of Medicine. “I couldn’t convince him to come back,” said Allen Ditto, who is 65. Edward III and Judy actively discouraged medical careers for their sons, then supported and took pride in the accomplishment. “I love what I do,” said Allen Ditto, who still makes house calls. There have been lots of tears, hugs, notes and gifts since Ditto announced his retirement in September 2018. Allen’s grandfather, Dr. Edward W. Ditto Jr., began his medical practice in Hagerstown in 1921, followed by Dr. Edward W. Ditto III in 1953. All three graduated from Hagerstown high schools and Jefferson Medical College in Philadelphia. Ditto Jr. retired in the early 1970s and Ditto III in 1999. A 1971 North Hagerstown High School graduate, Allen met Judy Hughes when they were in the same grade at North Potomac Junior High. “We took an instant dislike to each other in seventh grade. It was not love at first sight,” Allen Ditto said. He recalls Judy always completing assignments before the due date. She remembers dioramas he made with Army men. Ditto always wanted to go to U.S. Military Academy at West Point. His parents took him for a visit in eighth grade. After 15 minutes, he knew it was not the place for him. “I hated it,” Ditto said. That’s when he got interested in first aid. He also got a taste for the work going on house calls with his grandfather and father. As a Boy Scout, Ditto assisted his Scoutmaster, local surgeon Dr. Frank Brumback, with first aid at Scouting activities. Hiking the entire 184.5-mile C&O Canal the summer after seventh grade helped Ditto realize he could accomplish anything with support and determination. “I wanted to quit every minute of every day, but they helped me,” Ditto said. One merit badge shy of Eagle Scout, Ditto said, he disappointed his mother. Even the Eagle project was completed and approved. All that was lacking was the approval of Ditto’s merit badge counselor. But they couldn’t connect over the summer before Ditto’s 18th birthday, the cutoff date. Allen Ditto’s father and son are both Eagle Scouts. Allen and Judy both played clarinet in Mr. Hurley’s orchestra class in 11th grade. During their college years, they wrote daily to each other, with Allen at Emory University in Atlanta for pre-med and Judy at James Madison University in Virginia. Allen and Judy got married in 1975 after graduation and moved to Philadelphia for medical school. “I always say we went to medical school. I wasn’t sure if I’d have finished if it wasn’t for her,” Allen Ditto said of Judy’s encouragement. His knack for worrying, though, has taken a toll over the years. “Part of the way he is is what makes him such a good doctor. I think it’s one of his best qualities. … You get weary about worrying (about patients),” Judy said. Life changed with the birth of twins Megan and Andrew in 1983. Career changes came in 12-year increments for Allen Ditto. After his third-year residency in Allentown, Pa., the Dittos returned to Hagerstown. He was in a solo private practice on Oak Hill Avenue the first dozen years. He and his father covered calls for each other. Then, for the next 12 years, they were part of a combined practice with several other doctors called Potomac Family Medicine on Northern Avenue. The last 12 years have been with Meritus Medical Group. The practice is now called Meritus Primary Care. It recently moved from Pennsylvania Avenue to Crayton Boulevard. Judy did all of the books and human resources for her husband’s solo practice and Potomac Family Medicine and early on with the last practice. Allen Ditto said a good doctor makes many decisions regarding patient care and there is much room for mistakes or errors of judgment, which is always on his mind. “On Feb. 1, I look forward to not worrying about that,” Allen Ditto said. For many years, he was voted #1 Doctor in The Herald-Mail and Hagerstown Magazine’s Hot List. Judy and Andrew convinced Allen to sit for the all-day specialty boards renewal test, giving him seven more years and more options in retirement. He took the test with longtime medical partner Dr. Stephen Metzner in April 2018. Judy worries that her husband, who likes to talk, won’t have anyone to talk to. Allen’s not worried about that at all. Besides assembling and detailing models, Allen loves to read, including two newspapers a day. He’ll have more time for all of that. The Dittos might join a bird watching group. Judy, Megan and Andrew are hosting an open house on Feb. 9 from 1:30 to 4:30 p.m. at Cortland Mansion for patients and colleagues to honor Allen Ditto’s years of medical service to the community. Allen opposes the idea, but was told it was non-negotiable. The open house will offer some closure and celebration. “I’ll miss seeing my patients. It’s been a privilege being part of their lives. I’ll really miss working with other doctors,” he said.